Momma Told Me: They must be putting something in the milk. Growing up I drank a lot of dairy. For the better part of years 3-10 I ate cereal 5 or more days a week, and with whole milk. Somewhere around my preteens my father became aware of his inherited genes, genes which have since been passed down to me, and made a conscious effort to eat healthier. This was particularly spurred by the need to cut cholesterol and saturated fats. Almost overnight milk, as I knew it, was gone. What greeted me at the table the following morning came in a jug identical to me precious milk, but bore a slightly different color label and the words 'Fat Free'. Now, anyone who has gone from Whole to Fat Free, or 1/2%, knows the dramatic difference. I've since spent my life referring to this 'milk' as 'white water'. By the time I was old enough to buy my own groceries and make my own eating decisions it was too late; I could never go back to the thick 'whole' milk, it simply didn't appeal. Then, just out of high school, and in a fresh relationship, I discovered the world of milk alternatives. My boyfriend, whom I was arguably inseparable with, drank Soymilk by preference, and that preference was for the brand Silk. I never knew there were so many varieties of soy-milk, let alone so many refrigerated variations of milk alternatives. As times still very much dictate, buying dairy based products was an expensive task, and I quickly fell in love with the convenience and freedom of milk alternative selections. You will rarely find a coupon for 'milk', but I almost always have coupons on hand for my favorite brand of milk alternative, making the savings all the sweeter. Most people who do not already possess a variation of dairy/lactose intolerance discover soy milk, and other alternatives, much like I did, through a loved one. Very few people seem to pick up soy-milk out of curiosity. Now an avid consumer, it's hard to imagine why, but I too recall my initial reservations about texture and taste. There certainly are enough brands and variations, and my experience has taught me they all have their own unique purposes. Almond and Coconut milk alternatives can be especially great for baking, or offer a sweeter finish to a healthier cereal/breakfast choice, while plain soymilk can be used in cooking for everything from sweets to savories. For more insight on milk alternatives check out our Google+ album. We always have Silk on hand in our household; and I have officially made the switch from 'water milk' to soy and almond milk. I can hardly remember what it was like to pour spoiled milk down the drain! In the past year Silk has really expanded their core line to include the wildly popular drink and smoothie aids, Fruit & Protein line, and the brand new Silk Iced Latte range at our local Walmart. If your tastebuds were as intrigued as mine at the sound of a ready-to-drink Iced Latte, then we are soul mates. Currently available in Mocha and Vanilla Soy Latte, this coffeehouse beverage is easy to serve over ice (though you'll have trouble breaking the 'sip from the carton' habit with this). At 100 calories per serving, Silk's Mocha Iced Latte is more coffee than sweet flavor, and very smooth for a dairy free beverage. This tastes even better blended with ice, and goes wonderful with a little bit of Malibu Rum when entertaining! Most recently I decided to see if I could incorporate this Silk variety into my everyday cooking, as I do with the standard line. 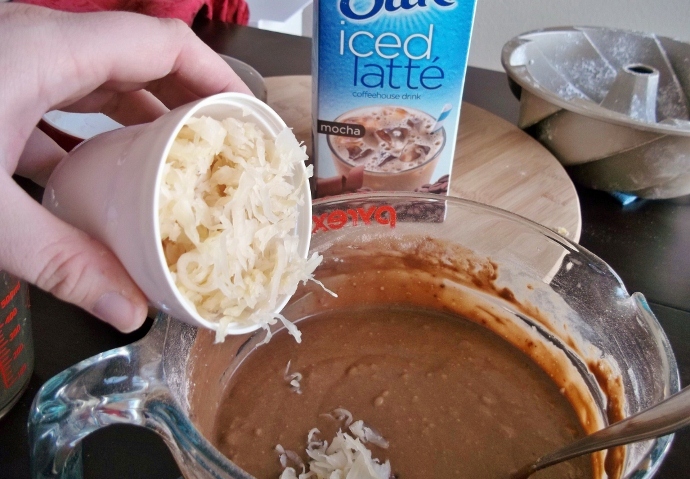 I decided to substitute the water in my family's German Chocolate Sauerkraut Cake recipe with Silk Mocha Iced Latte. It's a German tradition to substitute water for fresh brewed coffee, so I knew it would transition well. For the most part, cooking with a milk alternative is much like any other substitution; with should be an even exchange for the liquid based dairy in any recipe. Unless you are modifying a recipe that calls specifically for whole milk, assume any thinning in texture, transitioning to a milk alternative, will not impact the overall texture of your recipe. However, there are many variations in flavor, when shopping for soy-milk, and you should always be sure that you are grabbing a flavor free, or 'Original', variety. Baking with Vanilla Silk is delicious but making mashed potatoes with it, not so much! We like to keep a gallon, or 2 half gallons, of Original Silk on hand, and a half gallon of our current flavor of choice. I know I will end up cooking with at least a half gallon throughout the week- so I like to have a 'hands off' carton designated for this. Need a little dairy-free inspiration? Check out the Silk Pinterest page for plenty of mouth watering ideas! 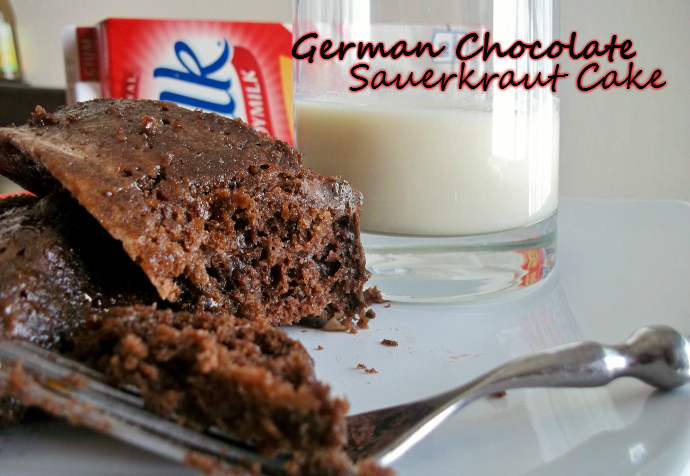 ***For those curious about the sauerkraut in the cake; I promise you the rinsed and dried sauerkraut offers no flavor to the cake; merely texture and the retention of moisture. Most of my guests assume it is coconut! 3.) Sift Cocoa, Flour, Baking Powder, Baking Soda, and Salt. Introduce alternately, with Silk Latte, to egg mixture. 4.) Stir in Sauerkraut and pour batter into prepared pans. 5.) Bake for 30 minutes, at 350F, or until a toothpick inserted comes out clean. Allow to cool entirely before loosening from pans. **This cake lends itself best to a glaze, rather than frosting, as it is dense and rich. 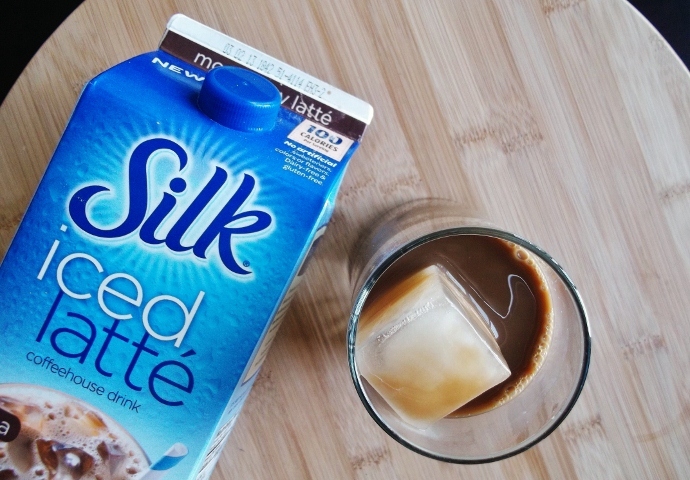 Also new for Silk is a reformulated recipe for their Original and Vanilla Soy-milk varieties. The new taste is slightly less sweet, in my opinion, and smoother to consume. That is to say there is less aftertaste, and the Original seems even more well suited for cooking. Silk has always sourced their beans from North America, and uses a whole soybean processing method that maintains a large percentage of the soybeans viable nutrients. This means that more calcium, fiber, omega-3s, and protein is kept in tact within the milk alternative. I bet you didn't know soy-milk can actually contain more calcium, per serving, than actual milk! When I tasted the new and improved Original Silk Soy-milk formula I was inspired to head online to their website, where there is a treasure trove of Silk dairy free recipes. I love that I can find recipes already adapted to milk alternatives, covering everything from side dishes to drinks and desserts. 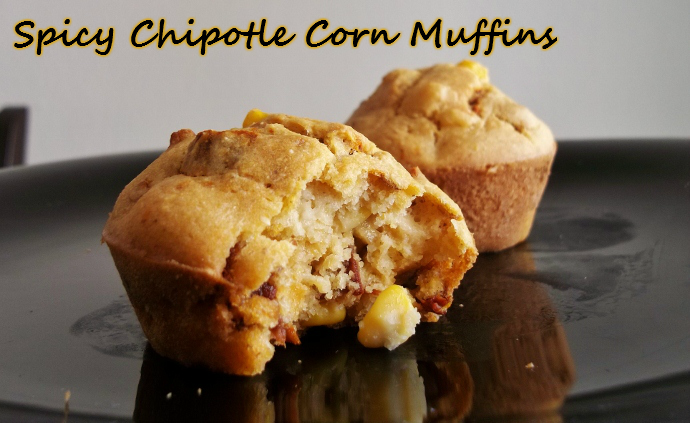 This week I decided to try a Spicy Chipotle Corn Muffin recipe; which came out unbelievably moist, but understandably hot! Cooking with Silk is just one of the ways I show my family I care; from Jeremy's Lactose Intolerance, to the extra calcium and nutrients we so sorely need. 2.) 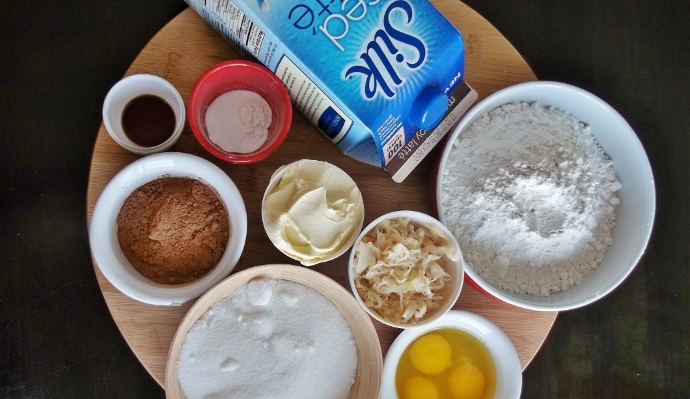 Whisk together Cornmeal, Flour, Baking Powder, Salt, and Cumin in a large bowl. 3.) In a separate bowl, whisk together Silk, Egg, Oil, and Honey. 4.) 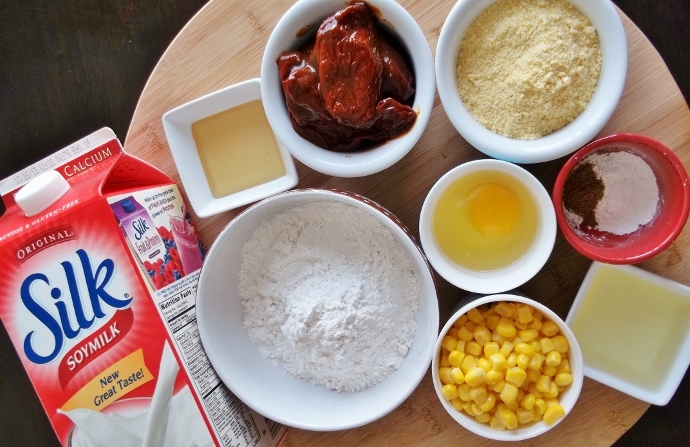 Pour Egg Mixture over Cornmeal Mixture and stir until ingredients are moistened. Do not over-mix. 5.) Gently stir chopped chilies and corn into batter. 6.) Spoon into prepared muffin tin (about 3/4 full), and bake for 15-18 minutes, until tops begin to turn golden brown. **We like to serve chili over this- be warned they are spicy! I like to pour half of the batter before adding the chilies, for those who have a more mild palette. What Daughter Says: Try Silk milk alternatives today and discover why Silk isn't just for the lactose-intolerant (or for drinking)! I am a member of the Collective Bias® Social Fabric® Community. This shop has been compensated as part of a social shopper insights study for Collective Bias® and WhiteWave. #CBias #SocialFabric. It is so amazing how versatile Silk Milk is. Love your recipes and fantastic pics!! 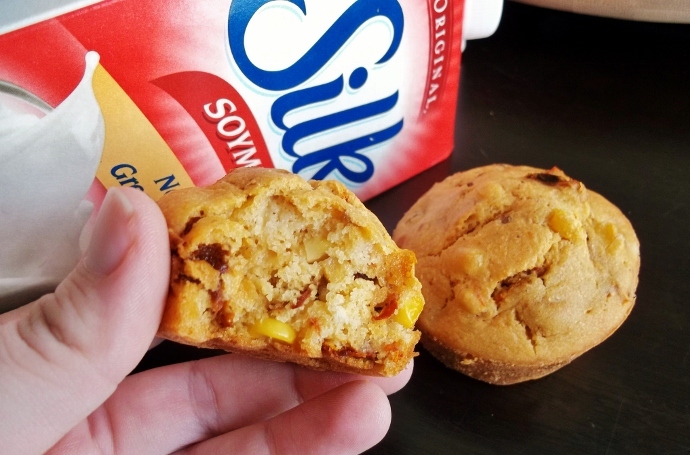 These are pretty cool recipes using SIlk - I may have to revise the corn muffins to fit my current diet plan - thanks for sharing. Those corn muffins sound amazing! Those spicy chipotle muffins look awesome! I am pinning them right now so that I don't forget to make them! We love Silk! Your recipe looks marvelous! These look delish - I love anything with chipotle. Thanks for linking up to Friday Food Frenzy!